Shanks has had the expectations placed on his shoulders since he was an emerging teen in Ireland and today, as he heads towards his 30’s, it’s no different. Packing one of the most deadly serves on the planet, this Irish striker will put you in a defensive stance and run you all over the court if he doesn’t end the rally first. Know for his amazing power and hook serves, Charly is opening eyes in America with stops at every Race event in 2011/12. In October of 2012, Shanks fell short in a close breaker to fellow countryman Robbie McCarthy in the finals of the Simple Green US Open of Handball. WPH: How would you describe the differences between playing in Ireland compared to paying in the U.S.? Charles: Handball in Ireland is quite different from playing in the U.S. The courts are colder, the ball is different, and the tournaments are all within 400 miles of one another. How difficult was making the transition to playing on the Race 4 Eight where you are traveling over 2,000 miles to each event, playing with a different ball, and adjusting to different conditions? WPH: You are one of the top players in Ireland, and you quickly became one of the top players on the Race 4 Eight Tour. How would you compare playing the R48 pros to playing the top Irish players? Charles: On the whole Irish players are definitely more patient with their general play during rallies. Whereas the US guys seem to drive the ball a lot more rather than play defense and they would also take on kill shots from arguably shady positions. WPH: You trained at the Sport Institute in Ireland with Aisling Reilly for a year and a half before coming to the U.S. in the summer of 2011. How has that training helped you, and what type of training have you done in the U.S. to stay sharp? Charles: The training has been a tremendous help and I hope to return to the institute when I return permanently to Ireland in the summer. Without getting into specific details it’s varied since my move to the US in the sense that I don’t get to do as much of it due to the number of competitions which is significantly more here in the US compared to the Irish season. WPH: What made you start playing handball? Did you have a coach? Why do you play handball? Charles: I started playing when I was around 10. My Dad was my first coach and he was followed my numerous others from my club Clann Eireann. WPH: You became the first player to win a traditional R48 event (non-U.S. Open) besides Luis Moreno or Sean Lenning in Houston. What did that mean to you to break through after so many near misses? Charles: It was a good win for me, I’d been knocking on the door a while. To me it meant ‘I just proved what I already knew that I was capable of winning pro-stops ‘. Now I want to win more. WPH: Following your win in Houston, you will become the #1 ranked R48 player if you make the semifinals in Alaska February 13-16. What would being #1 mean to you? Charles: The type of person that would strive for such an accolade would be ego-driven in my book, that’s not me. I want to achieve my potential and win tournaments along the way maybe even a US Nationals and All Ireland Senior. Bottom line is I’m grateful for all the opportunities handball has provided and how it’s given me life skills which I’ve successfully transferred to academic and work life. I owe handball and will repay when my days playing at the top level are done. WPH: You are one of only two players on the R48 Tour to have defeated every player in the Elite 8 (Moreno being the other). Who do you consider to be your greatest rivals on the R48 Tour? Who is the most difficult to play and why? Charles: I’d say Moreno more so than Lenning simply because I’ve only ever played Lenning once in the entire two seasons. I’ve played Moreno countless times and had some good wins but on the whole he has had the edge to date. WPH: You are widely regarded as one of the best or the best servers in the sport. How did you develop your serve? What advice would you have for up-and-coming junior players to looking to improve their serves? Charles: Practice. Through practice I’ve been able to develop my technique and when understand better why my serve is not on some days. Advice to juniors trying a similar low and hard server would be to keep your body low and follow through. WPH: You will be moving back to Ireland this summer and marrying your lovely fiancé. 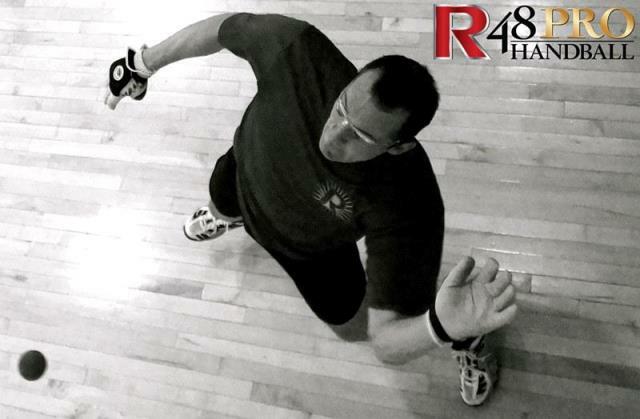 Will you continue to compete on the R48 Tour in 2012-2013? Charles: Competing on the tour full time like the last two seasons is unlikely. But I do hope to make some WPH events in the next season where work and Irish handball commitments allow. WPH: What have been your favorite stops on the R48 Tour? Why? Charles: They’ve all been good for different reasons. US Open has the best location, sunny Cali. Salt Lake City and Alaska have the best handball communities, they went beyond the call of duty! Houston and Denver were excellent well organized stops and they were appreciative when watching the pros. WPH: You have been a guy whose game has peaked for the biggest events. Is that a coincidence? What do you do to play your best at those biggest events? Charles: I work full-time for IBM so my time and resources are spread thin. I always devote more time to preparing and focusing for the big ones and so I normally play better. WPH: What does it mean to you to be a huge part of the innovative WPH Race 4 Eight Tour that broadcasts all of the matches and provides players with the opportunity to qualify for the most prestigious and exclusive event in the sport at The Player’s Championship in Seattle? Charles: I’ve enjoyed traveling around different US cities and touring the must see sights as much as playing. So it’s been a very rewarding journey on the way to Seattle.